In the early 1820’s, the majority of the Cherokee people learned to read and write their own language, and they did it without any schools or educational system at all! They quickly became more literate than the white people who lived around them. King Seijong of Korea did something very remarkable in the Fifteenth Century. It is definitely not easy for an illiterate adult (or even a well-educated foreigner) to learn to read and write Chinese. It would take many years of constant study. If you have any doubt about that, see how long it would take you to learn to write or read even a dozen Chinese words. Try it! Seijong knew that writing Korean in Chinese characters kept most of his people from ever learning to read. In 1446, he created the Korean han’gul alphabet of 24 letters–14 consonants and 10 vowels–that is probably the most perfectly suited to its language of any alphabet in existence. Anyone who knows how to speak Korean can learn to read and write it in a few days. There is no need to study spelling at all; if you can say the word, you can write it. And, there are a lot of other things about the Korean alphabet that make it very special, but we won’t go into the details here. It is still in use after nearly 600 years. The first person in recorded human history who single-handedly created a written form of his own language was [maybe] King Seijong. There are several different stories about Sequoyah’s ancestry, some of which were invented by white people who wanted to include him as a relative, after he became famous. His mother came from a good Cherokee family; her brother was a chief at Echota [in what is now Monroe County, TN]. She may have had some white blood. But, who was his father? There is no certainty, but I will tell you what I think is the real story. His father was probably a half-breed who may have worked for the garrison at old FortLoudon. His family name was Gist; maybe he was a scout. He moved on shortly and had no part in Sequoyah’s life. Sequoyah was raised by his mother at the old settlement of Tuskegee, near Fort Loudon. Tuskegee [Cherokee Tasgigi] took its name from some forgotten tribe that had blended in with both the Cherokee and the Creeks; the name occurs in several other places, including in Creek lands in Alabama, from which came the name of Tuskegee University. Very little is known of Sequoyah’s early life. He seemed to have a special knack for mechanical things. He worked with silver and other metals and he was a blacksmith. A hunting accident–or perhaps a childhood accident or deformity– left him partly crippled, and he had time to tinker around with ideas. In 1809, he began to think about how it was that white people could communicate by marks on paper. Knowing nothing at all about reading or writing, he began to work on some way the Cherokee people could have a system of writing. He kept trying despite discouragement and ridicule and all sorts of failures. He had little or no paper, so he scratched his ideas on homemade shingles. At least once, all the work that he had done was destroyed and he was accused of being a witch. At first, he tried to draw a picture for each Cherokee word. That way did not work, he found. There were too many words and [we now know] he would have ended up with a written language like Chinese. Besides, he found that it was too tedious to draw so many pictures and he was not much of an artist anyway. It is said that Sequoyah used an old English spelling book someone gave him to find some of the characters he created. Keep in mind that he knew nothing at all of English. 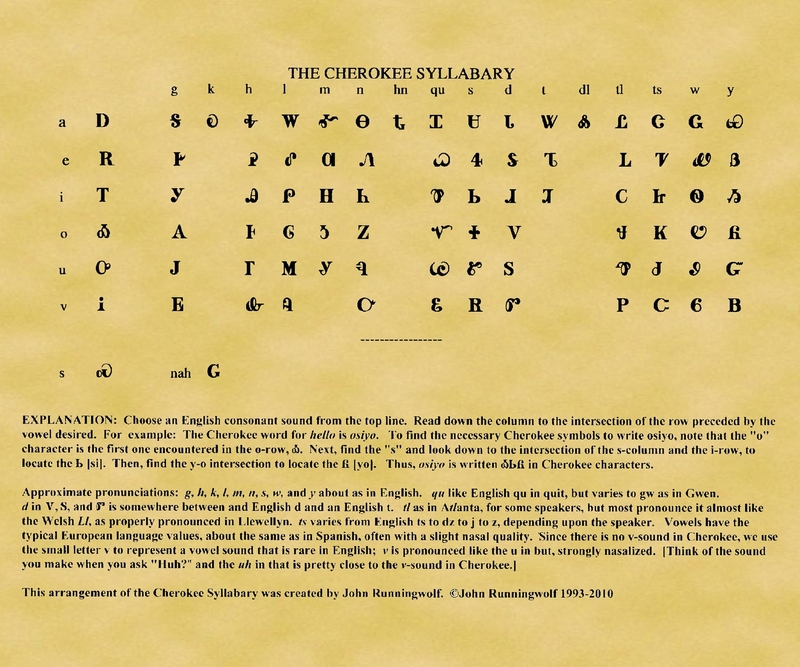 About two dozen of the syllabary characters were taken directly from English letters, but the Cherokee sounds have no connection at all with the English sounds. Others were made up by adding lines or curves to various English letters, or by turning them upside down. At least two Greek letters were used. Some numerals [4 and 6] became symbols. The rest were created from whatever could be found. Cherokee people began proudly to send written messages to one another, even to next-door neighbors, and the Eastern people began to exchange correspondence with the Western Cherokee, those people who had already moved to Arkansas and Oklahoma territories before the Removal. Sequoyah, by the way, never became a convert to Christianity; he continued all his life in the old beliefs. In 1822, he took the syllabary to the Arkansas Band of the Cherokee. In 1823, he moved permanently to the west and never returned to Alabama. In 1843, he went into Mexico to search for lost Cherokee who had moved there years before. He died alone on that trip. He left behind a widow, two sons, and a daughter. His wife received a pension from the government in appreciation of Sequoyah’s great contribution. 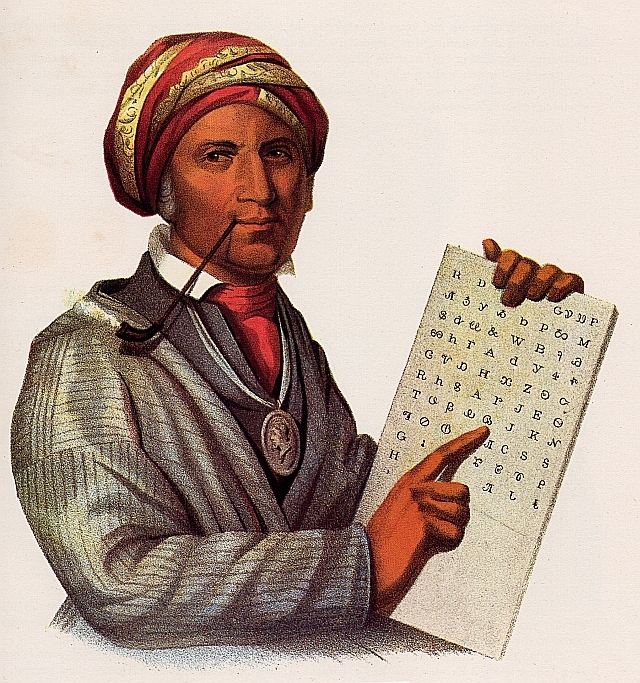 We might argue that Sequoyah’s syllabary showed even greater genius than Seijong’s alphabet, because Sequoyah knew nothing of reading or writing or linguistics, while Seijong was highly educated and had a deep understanding of linguistics, and he probably had some help. But, in any case, the two of them stand alone in all of history. No other human has ever created a written form of his own language. At the beginning of this blog is my personal arrangement of the Cherokee Syllabary. The characters are all the same, of course, but this special arrangement is, at least to my way of thinking, more useful than the older, traditional one. To view the image: Right click on the image, then click “View Image.” A smaller and more manageable image will be brought up. To see it full-size, click again. This arrangement of the Syllabary is copyrighted by me. I have found this photograph of Katalsta, taken in 1888, in the Smithsonian collections. She and her daughter, Ewi Katalsta, were prominent potters in their time. 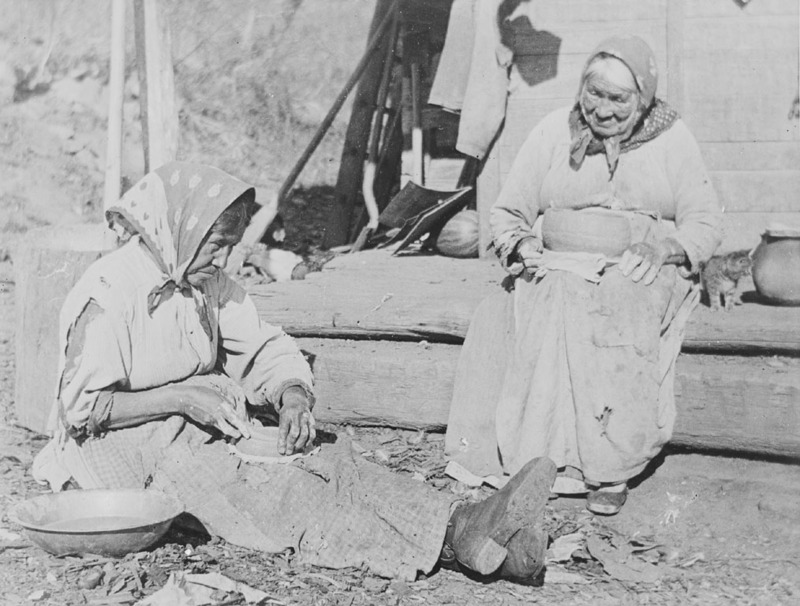 Katalsta is the woman on the right; the other woman is not identified, but it is possible that she may have been Ewi, who would have been in her 50’s at the time. A half mile or so to the southwest of Katalsta Ridge is a very pretty stream, Taywa Creek, which has some small cascades worthy of a hike to enjoy. The creek’s name is from the Cherokee word “tewa,” the name of the flying squirrel. About the spelling of Sequoyah, using the Syllabary: There are no fully standardized spellings of words and names in Cherokee, but anyone who understands and reads the language would know what is meant by any spelling written by another Cherokee. Sequoyah himself spelled his name using the Cherokee characters for “Ssiquoya,” although the initial S was completely redundant. When Anglicized, “kwo” and “quo” are written with the same Cherokee character. Next question, what is an “ideographic system” of writing? Each symbol represents an idea, not a word. Actually, many different languages are spoken in China; yet, a newspaper can be read by any educated person who knows how to use the ideograms, even if he or she has no knowledge of Mandarin Chinese, the principal language of China. We use a few ideograms (= ideographic symbols) in English, too. For example, consider the number 3 [or any other numeral you like]. We read it and think “three,” even though the word is not there. A person from Mexico would read it as “tres” and a person from France would read “trois,” and so on. The ideogram “3” represents the idea of a collection of three things, no matter what the word is in some specific language. The “Lost Cherokee”: At several times, groups of Cherokee people moved into Mexico to find a more free existence than was possible in the United States and its territories. Some of them had settled in Texas when it was still a part of Mexico, and the Spanish government had granted land to them. When Texas became a free republic with Sam Houston as its President, Houston–who had been adopted by the Cherokee and who was married to a Cherokee woman–tried very hard and without success to have the Republic recognize the Cherokee land rights. The second President of Texas vowed that he would run all Indians out of Texas. The Cherokee were forced to flee into Mexico; their descendants still live in the area near Lake Chalapa, just south of Guadalajara. However, the “Lost Cherokee” that Sequoyah wanted to find were a semi-legendary band who may have moved west around 1750 or so, before the American Revolution, long before the Trail of Tears and long before Texas became a republic. One of several half-siblings of Sequoyah was Ahuludegi, known to the white people as “Drum” or “John Jolly.” Ahuludegi translates roughly as “he is always throwing away the drum.” His father is thought to have been a white man, Robert Due. He was the chief who brought Sam Houston into the Cherokee tribe, thereby becoming Houston’s adopted father. Jolly’s niece, Talihina Rogers, became Houston’s second wife after the Trail of Tears. Because I have had many requests for framed copies of my arrangement of the Cherokee Syllabary, I have made it available, with a background image of Sequoyah. You can find it here if you are interested. Note the error in the second from last line at the bottom of this syllabary. Instead of the symbol for “go” there should appear the symbol for “do.” The Cherokee syllable <do> is fairly often sounded as <to>, but the syllable <go> is never, for any reason, pronounced <to>! This entry was tagged Ahuludegi, atolsdiha, Cherokee alphabet, Cherokee in Mexico, Cherokee letters, Cherokee Syllabary, Cherokee Syllabary framed print, Cherokee symbols, Chinese language, Drowning Bear, Drum, Ewi Katalsta, Framed Cherokee Syllabary, George Gist, George Guess, Giant Redwood, han'gul, ideographic language, ideographs, John Jolly, Katalsta Ridge, King Seijong, Korean alphabet, Korean language, Lost Cherokee, Mount Yonaguska, New arrangement of Cherokee Syllabary, Picture of Sequoyah, Red-Headed Will, Sequoia sempervirens, Sequoyah, Sikwayi, Sikwoya, Sikwoyi, siqua, Ssiquoya, Talihina Rogers, Taywa Creek, Tewa, The Drum, The Lost Cherokee, utsetsidi, White Chief of the Cherokee, Will Thomas, Willstown, Yanagunski, Yanagvski, Yonaguska, Yonagvsgi. Bookmark the permalink. I don’t know how much is true about Sequoyah, but Nathaniel Gist is all white and not a half breed. I’m looking for true information but keep running into misinformation. My family tree lists George Sequoyah gist as a son of Nathaniel. He married Wurtah after his first wife died.